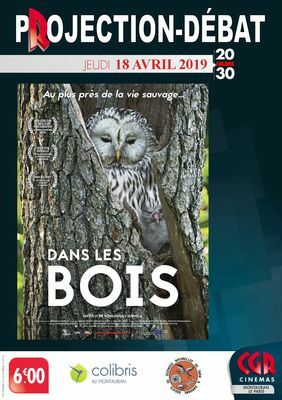 Thursday, April 18 at 20:30, the cinema CGR LE PARIS of Montauban proposes a cinema-debate around the documentary DANS LES BOIS; Documentary Mindaugas Survila. Lithuanian, Estonian, German film. 1:03. From 6 years old. Closer to the wild ... In the woods takes us to a place where the limits of time have disappeared, in a wild and fragile beauty. This total immersion in these ancestral forests is a powerful experience for spectators of all ages. Minaudas Survila's camera was able to capture and film the animals of these woods as seldom. Carried by a soundtrack composed only of sounds of the forest almost palpable, this documentary is an atypical testimony, poetic and fascinating when one thinks of the speed with which these still virgin places are being erased from the surface of the earth ... A session proposed and animated by the Society of Natural Sciences of Tarn-et-Garonne and Hummingbirds 82.